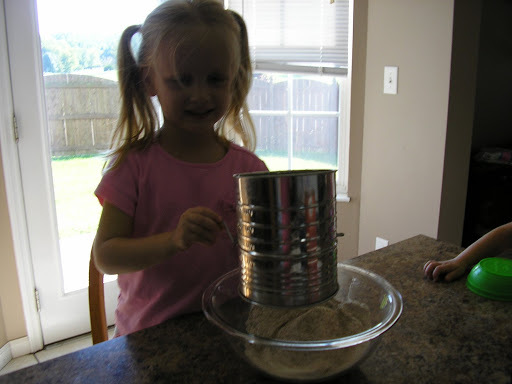 I am a little behind on my cooking with Norah posts – so this will include 2 different things we have made. 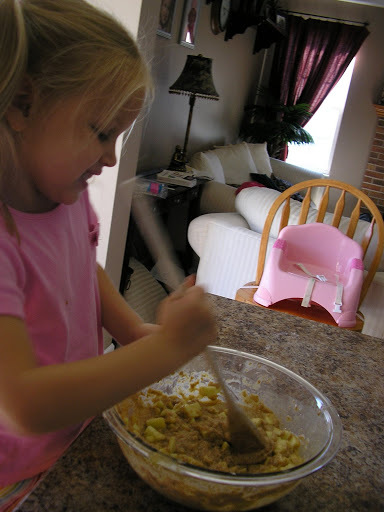 Yesterday Norah and I made a yummy coffee cake called Blitz Kuchen – it is a recipe from my grandma and is very yummy. Part of the reason we made this was because it is more than just mixing ingredients together (like all the muffins we make). I showed Norah how to separate the egg whites from the egg yolks. Then we had to beat the egg whites and fold them in. Norah was quite fascinated with the whole process. Pour into a greased 9 X 13-inch cake pan. Sprinkle with walnuts and a mixture of cinnamon and sugar. Bake at 350 for 30 minutes. After baking Norah asked if she could help with the dishes! Umm, of course! She said, “We always have to clean up our mess in the kitchen when we cook.” Good girl! Another favorite at our house is pumpkin bread! In a bowl, combine the first 8 ingredients. In another bowl, combine pumpkin, egg substitute, wather and oil; mix well. Stir into dry ingredients just until moistened. Fold in walnuts. Pour into a 9x5x3-in loaf pan coated with nonstick cooking spray. Bake at 350 for 60-65 minutes or until toothpick inserted near the center comes out clean. Cool for 15 minutes before removing from pan to wire rack. This week I had a cooking activity for both girls. I think this was the first time that I have let Lucy help. Cooking with Lucy is much messier and takes much longer, but I knew she would love it. Lucy and I made Oatmeal Squares from this cookbook. They have a ton of butter and brown sugar – so I need to figure out a better way to make them, but it is super easy. Grease 7 x 11 pan. Melt butter, sugar & corn syrup in saucepan over low heat, stirring carefully until butter is melted. Take off heat and add oatmeal and dried fruit – stir well. Pour into pan and press it down. Bake for 20-25 minutes. Let cool, then store in airtight container. Norah and I made Cinnamon Apple Muffins. The recipe is a combination of several and I have adjusted it to make it a little healthier. Sift flours and milled flaxseed into bowl. Add sugar, baking powder, & cinnamon and stir. Add remaining ingredients and stir until flour is moistened. Spoon into muffin tin. Bake 18-23 minutes. Let stand 5 minutes. For our cooking project yesterday, Norah and I made Chicken Alfredo Pizza. This is one of Kevin’s favorite things to eat. He occassionally gets it at Olive Garden or Uno’s Pizza, but we decided to attempt to make it at home. I should add – for anyone interested in making this – that it is NOT a healthy recipe. I often try to make a recipe healthier, but since this was my first time making this, I decided to make it just as the recipe says. Also, it is pretty time consuming and messy – there are quite a few steps. I made the dough for the pizza crust while the girls played, then let it rise while we put Lucy down for a nap. Norah was an excellent helper and I’m sure she will be a great cook someday. I never tell Norah to pose or smile for most pictures, but she does anyway – even when I am looking for an “action” shot. I forgot to take a picture after I baked it. It turned out really well. Next time I will add a little more seasoning to the crust – it was slightly bland.